Click here to print. 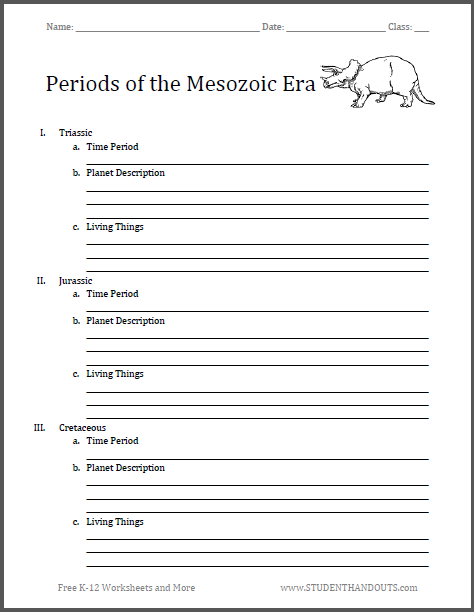 Students learn about a favorite topic--dinosaurs--by completing this common core blank outline on the three periods of the Mesozoic Era--the Triassic, Jurassic, and Cretaceous. For grades four and up. Possible point scale: Two points for each time period and four points for each planet description and list of living things, for a total of ten points per period and thirty points total. For our free printable biology worksheets for upper elementary, click here.